What is special about SPIROPLAN® right-angle gear units is their wear-free gearing. It ensures that the power is transmitted reliably and adjusts the speed in your materials handling system. With this gearing, our SPIROPLAN® right-angle gear units deliver output torques up to 180 Nm in the power range from 0.09 kW to 3 kW. The steel-steel material combination and the special tooth meshing enable a short gear unit design for space-saving installation of the drives. Thanks to their aluminum housing, these right-angle gear units are real lightweights. Their special gearing and lubrication for life ensure that they require very little maintenance. These gear units are designed for long and reliable operation. 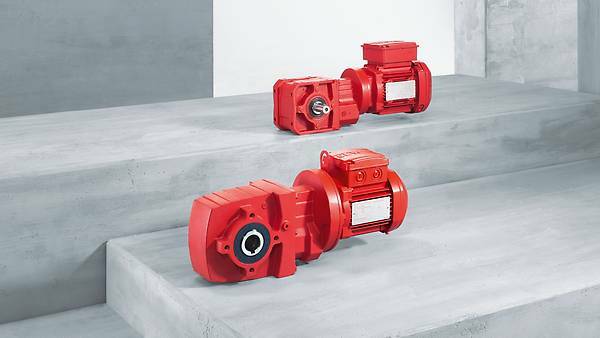 No compromises: The SPIROPLAN® right-angle gear units are suitable for almost any drive task due to their many design variants. Only half the solution without a motor? Then use our modular concept and combine the gear units of the W series with an AC motor to a W..DR.. SPIROPLAN® right-angle gearmotor, or with a servomotor to a W..CMP SPIROPLAN® servo right-angle gearmotor of your choice. Or simply choose the separate AC motor or servomotor that meets your requirements.